Discover how to tap into your extraordinary human capacity for connection and healing using astonishing new findings about the miraculous power of group intention in this new book by the author of the international bestsellers The Intention Experiment and The Field. In The Power of Eight, Lynne McTaggart—whose “work has had an unprecedented impact on the way everyday people think of themselves in the world” (Gregg Braden, author of The Divine Matrix)—reveals her remarkable findings from ten years of experimenting with small and large groups about how the power of group intention can heal our lives and change the world for the better. When individuals in a group focus their intention together on a single target, a powerful collective dynamic emerges that can heal longstanding conditions, mend fractured relationships, lower violence, and even rekindle life purpose. But the greatest untold truth of all is that group intention has a mirror effect, not only affecting the recipient but also reflecting back on the senders. 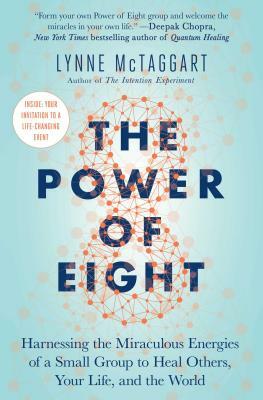 Drawing on hundreds of case studies, the latest brain research, and dozens of McTaggart’s own university studies, The Power of Eight provides solid evidence showing that there is such a thing as a collective consciousness. Now you can learn to use it and unleash the power you hold inside of you to heal your own life, with help from this riveting, highly accessible book. Lynne McTaggart, one of the central authorities on the new science of consciousness, is the award-winning author of seven books, including the internationally bestselling The Intention Experiment and The Field. She is also editorial director of What Doctors Don’t Tell You, one of the world’s most respected health magazines, and architect of the Intention Experiments, a web-based “global laboratory.” A highly sought-after public speaker, Lynne is consistently listed as one of the world’s 100 most spiritually influential people. Lynne and her husband, author and WDDTY co-founder Bryan Hubbard, who live in London, have two adult daughters.